Experts since the mid-2000s have forecasted that flash memory would eventually surpass traditional hard drives in the cost category, a vital metric in the enterprise space. Many believed that due to stagnation in hard drive density technology, the switch to flash in bulk storage environments was imminent. Western Digital’s latest advancement, however, looks to prolong the transition by at least an additional decade. At a recent event in San Jose, Western Digital announced a breakthrough in ultra-high capacity storage called microwave-assisted magnetic recording (MAMR). 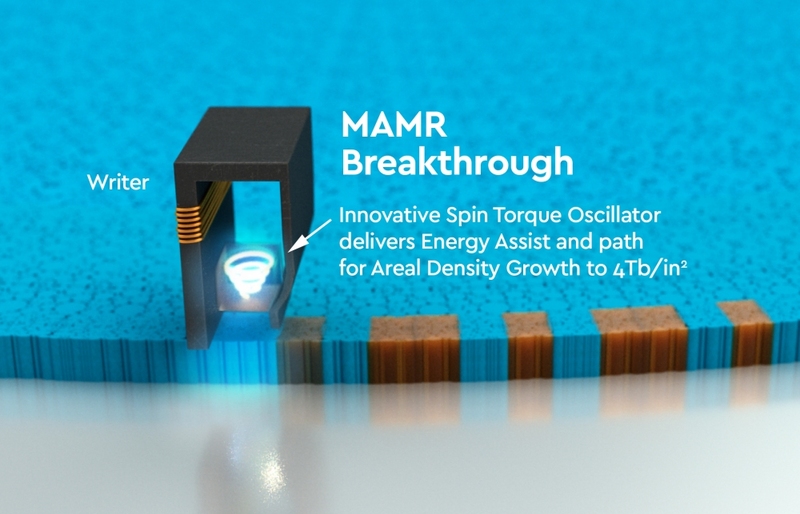 One of two energy-assisted technologies that Western Digital has been working on for years, MAMR uses a “spin torque oscillator” to generate a microwave field that increases the ability to record data at high density without sacrificing reliability. According to the company, the technology will enable hard drives with 40TB of capacity by 2025 and will offer over four terabits-per-square-inch over time. MAMR technology was developed primarily in-house with help from researchers at Carnegie Mellon University. As a result, executives believe it’ll give them a two- to three-year lead over competitors like Toshiba and Seagate and help them gain valuable market share among major players that utilize loads of storage like Facebook, Google and Microsoft. Western Digital said it expects to ship ultra-high capacity MAMR hard drives to datacenter clients beginning in 2019.